Transit buses throughout King and Snohomish counties remain on reduced snow schedules, and Community Transit faces 45-minute delays on local routes, as slush covers Seattle streets and snow falls to the north. King County Metro Transit is operating its second weekday of limited “emergency snow network” service on mostly high-ridership, low-slope routes. Service was reduced 60 percent and some areas are being skipped. Highway traffic is light, but a fallen tree blocked two lanes of southbound I-405 late in Tuesday’s morning commute, and standing water will cause cars to hydroplane. Washington State Patrol trooper Heather Axtman, on duty between Lake Stevens and Marysville, said it was 31 degrees and still snowing around 9 a.m. Highway 9 was slushy mixed with ice patches. “It’s like driving through a 7-11 Slurpee and it’s not safe,” she said. Roads marked for 55 mph might look OK, but drivers should slow down, she said. New hazards follow the snow that caused more than 800 spinouts and crashes in Snohomish County and points north the past week, she said. I-90 through Snoqualmie Pass has been closed all morning Tuesday. Sound Transit’s light rail has been running trouble-free. Sounder commuter trains have normal weekday schedules but are vulnerable to delays, for instance if switches freeze. Community Transit is returning to normal schedules Tuesday on most of its freeway commuter routes into Bellevue and Seattle. But ridership overall has dropped far below the 30,000 daily passengers, as local buses slog through snowy side streets. All of Community Transit’s articulated, 60-foot buses were taken off the streets because they’re prone to spinouts. King County Metro is highly dependent on those two-chamber buses and has operated them with tire chains. A foot of snow fell overnight to slow trips around Snohomish, and buses farther out between Sultan and Gold Bar were canceled, said spokesman Martin Munguia. As for the express lines, Community Transit now owns 70 double-decker buses, plus 30 more it operates for Sound Transit, he said. “It’s way better than it would have been five years ago,” Munguia said. As a result of reducing bus fleets, Sound Transit Route 532, which Community Transit operates, was canceled; riders must detour to Route 512 from Everett to Lynnwood. Route 535 was reduced so it misses University of Washington-Bothell. Metro will decide by late morning whether to stay on reduced service Wednesday. The National Weather Service predicts a heavy rain-snow mix with highs above freezing for Seattle. 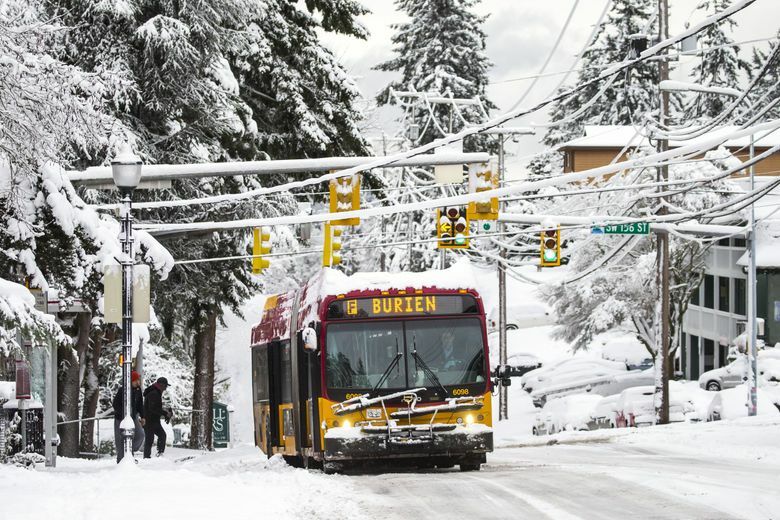 Many customers have praised their transit operators for persevering through the cold and snow this week, and extra “thank yous” are commonplace as commuters step off RapidRide trips operating near full schedule. Bu the sharp Metro cutbacks — announced Friday afternoon — also caught many riders by surprise. Some used words like “Byzantine” to describe Metro’s maps and alerts. Seattle’s South Park neighborhood, despite being in lowlands along the Duwamish River, was left completely isolated by the snow network, because of cancellations to hilly Burien and Seattle routes that pass through South Park. “I honestly feared I would fall and freeze, I intend to continue to pursue the thinking behind stranding an entire community and rolling out a program this haphazardly when lives are a part of the equation, this … is a reason people won’t trust the bus,” a resident named Shari tweeted to Metro. Metro said it has added a South Park-Georgetown shuttle Tuesday morning. “We continue to get feedback from people and we want to learn,” spokesman Jeff Switzer said. Since Friday, the website was refined to include click-on pages where riders can check routes in their part of the county. A Metro rider in Renton Highlands vented about lost service there, forcing people to make an arduous walk up Sunset Boulevard. The West Seattle Water Taxi is on normal schedule, but Ride 2 door-to-dock service is canceled, and part of the Route 775 water-taxi shuttle route on Admiral Way also was skipped. A mile away Tuesday morning, a water-taxi commuter was lost on Fauntleroy Way Southwest, and a passing RapidRide driver was unable to recommend another way to reach the dock far downhill. In the Wallingford area, a neighbor posted a cardboard sign at a bus stop next to Northeast 50th Street that said Route 26 wasn’t operating. Metro posted a network map and descriptions on its blog, where customers can click on their area to get more detailed information. A total of 67 routes, shuttles and neighborhood buses are running. These include 3, 4, 5, 7, 10, 21, 24, 24 shuttle, 31, 32, 36, 40, 41, 44, 45, 48, 62, 62 shuttle, 65, 70, 75, 101, 102 shuttle, 106, 106 shuttle, 120, 124, 128, 150, 166, 168, 169, 180, 181, 235, 245, 248, 252/255 shuttle, 255, 255 shuttle, 271, 331, 345, 348, 348 shuttle, 372 Woodinville and 372 Lake City, ST 522, ST 545, ST 550, ST 554, ST 554 shuttle, and RapidRide A, B, C, D, E and F lines. A 90 shuttle circulating on First Hill and Capitol Hill has been activated. Shuttle routes typically require riders to switch buses to reach outlying neighborhoods. To confirm whether a bus is coming or canceled, Metro travelers can text to 62550 and enter the number of the bus stop or shelter as the text message. Also, the phone center opens at 6 a.m. and people can call 206-553-3000 with service questions. Metro must make bus-service decisions early, because the agency needs nearly a full day to schedule bus drivers, remove chains and do other maintenance, said King County Executive Dow Constantine. Constantine said a one-day catchup period helps Metro prepare for when the 237-route regular schedule resumes. Some 300 buses of the 1,540-vehicle fleet were sidelined because of damage or maintenance backlogs last week, as workers rehabbed them around the clock. “We need to get them back to good repair, so we can get them back to full service when the snow’s gone,” he said. Metro is using its snow network in 2019 for the first time. The agency drew up its plan after the December 2008 storm in which Seattle treated the roads with sand, not salt, and Metro improvised to deal with lingering ice by cutting service in half.